Simplicity has its advantages and these Memo Pins couldn't be more simple. 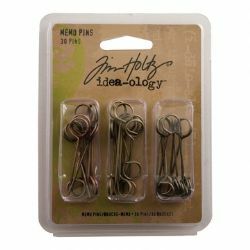 The split ring design on the head of these pins allows you to secure anything from ephemera and tickets to charms and other precious mementos. Pin them through your project to add a functional and creative attachment element.